MIT’s new approach to the design of a liquid battery uses a passive, gravity-fed arrangement similar to an old-fashioned hourglass. The concept could offer great advantages due to the system’s low cost and the simplicity of its design and operation. The MIT team of researchers has made a demonstration version of the new battery. Liquid flow batteries – in which the positive and negative electrodes are each in liquid form and separated by a membrane – are not a new concept, and some members of this research team unveiled an earlier concept three years ago. The basic technology can use a variety of chemical formulations, including the same chemical compounds found in today’s lithium-ion batteries. In the new flow concept, key components are not solid slabs that remain in place for the life of the battery, but rather tiny particles that can be carried along in a liquid slurry. Increasing storage capacity simply requires bigger tanks to hold the slurry. A new concept for a flow battery functions like an old hourglass or egg timer, with particles (in this case carried as a slurry) flowing through a narrow opening from one tank to another. The flow can then be reversed by turning the device over. Image Credit: The MIT Research Team. Click image for the largest view. Until creative genius kicked in. The MIT team’s new version, which substitutes a simple gravity feed for the pump system, eliminates that complexity. The rate of energy production can be adjusted simply by changing the angle of the device, thus speeding up or slowing down the rate of flow. The concept is described in a paper in the journal Energy and Environmental Science, co-authored by Kyocera Professor of Ceramics Yet-Ming Chiang, Pappalardo Professor of Mechanical Engineering Alexander Slocum, School of Engineering Professor of Teaching Innovation Gareth McKinley, and POSCO Professor of Materials Science and Engineering W. Craig Carter, as well as postdoc Xinwei Chen, graduate student Brandon Hopkins, with two graduate students Ahmed Helal and Frank Fan, and postdocs Kyle Smith and Zheng Li..
Chiang described the new approach as something like a “concept car” – a design that is not expected to go into production as it is but that demonstrates some new ideas that can ultimately lead to a real product. The original concept for flow batteries dates back to the 1970s, but the early versions used materials that had very low energy-density – that is, they had a low capacity for storing energy in proportion to their weight. A major new step in the development of flow batteries came with the introduction of high-energy-density versions a few years ago, including one developed by members of this MIT team, that used the same chemical compounds as conventional lithium-ion batteries. That version had many advantages but shared with other flow batteries the disadvantage of complexity in its plumbing systems. 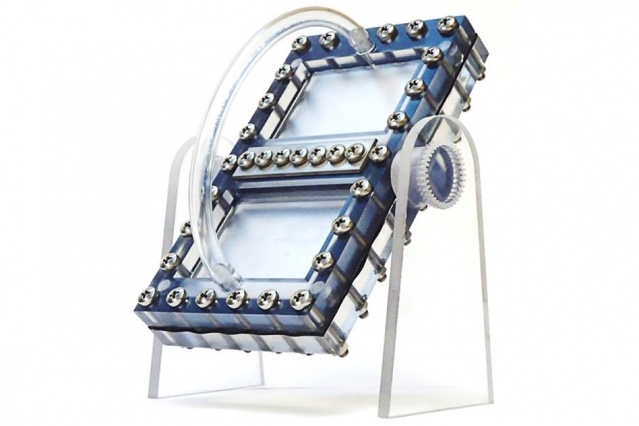 In the proof-of-concept version the team built, only one of the two sides of the battery is composed of flowing liquid, while the other side – a sheet of lithium – is in solid form. The team decided to try out the concept in a simpler form before making their ultimate goal, a version where both sides (the positive and negative electrodes) are liquid and flow side by side through an opening while separated by a membrane. The new design should make possible simpler and more compact battery systems, which could be inexpensive and modular, allowing for gradual expansion of grid-connected storage systems to meet growing demand, Chiang said. Such storage systems will be critical for scaling up the use of intermittent power sources such as wind and solar. While a conventional, all-solid battery requires electrical connectors for each of the cells that make up a large battery system, in the flow battery only the small region at the center – the “neck” of the hourglass – requires these contacts, greatly simplifying the mechanical assembly of the system, Chiang says. The components are simple enough that they could be made through injection molding or even 3-D printing, he said. In addition, the basic concept of the flow battery makes it possible to choose independently the two main characteristics of a desired battery system: its energy density (how much energy it can deliver at a given moment) and its power density (how much total power can be stored in the system). For the new liquid battery, the power density is determined by the size of the “stack,” the contacts where the battery particles flow through, while the energy density is determined by the size of its storage tanks. “In a conventional battery, the power and energy are highly interdependent,” Chiang said. The trickiest part of the design process, he said, was controlling the characteristics of the liquid slurry to control the flow rates. The thick liquids behave a bit like ketchup in a bottle – it’s hard to get it flowing in the first place, but then once it starts, the flow can be too sudden. Getting the flow just right required a long process of fine-tuning both the liquid mixture and the design of the mechanical structures. This is a grand example of innovation and creativity. Congratulations are in order with an applause. Great work here. Its easy to see that others will likely seize on this and innovate more. The potential is huge. In a little while someone will think to move the pivot axis 90º, so as to tilt more than flip, to reduce floor space. There are sure to be lots of ideas on how to increase practicality across environments, demands and resources. Your humble writer thinks MIT might have just lit off the flow battery industry.